Since our family started Ontario Bakery (now also in Rancho Cucamonga) almost 50 years ago, baby showers have changed. While cakes have always been a staple of the baby shower, in the old days, the gender of the baby was always a mystery. Nowadays, most couples know the gender of their baby after the 4 month ultrasound, and many choose a custom cake that reflects a boy or girl theme. 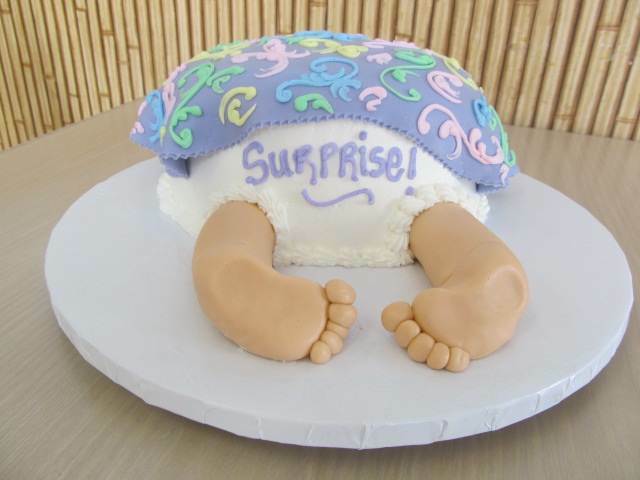 In a new tradition, some couples are instead choosing to let the cake itself reveal the surprise of the baby's gender. In the presence of friends and family, this moment can be shared in a more personal way than in the clinical setting of a doctor's office. 1. The family arranges for the ultrasound to be performed, with the results kept a secret from them. 2. The results are put in a sealed envelope, which the family delivers to Ontario Bakery. You choose from our array of cake flavors and fillings. 3. Our expert bakers bake up a very special custom cake: pink for a girl, or blue for a boy. We then disguise the tell-tale cake in a gender-neutral frosting of your choice. 4. During your baby shower, you cut the cake to reveal your baby's gender in the presence of your friends and family, and then celebrate like crazy! That's really surprising. Whatever the country is, every parent is equally excited about their children. The gender selection natural process make their happiness double helping in conceiving the desire gender baby.